completely sold out and was a huge hit in our drone community. However, the problem was that you couldn’t fly them too far without having to change the batteries. This meant people were spending loads of money on new batteries because they didn’t have time to charge their existing ones one at a time on a USB charger. Well, the remedy to this problem was fixed by Turnigy. Turnigy has made charging multiple micro batteries even easier with their Turnigy Micro Battery Charging Box. This article will let you know if it is worth buying this micro charger from HobbyKing. So What Does The Turnigy Micro Battery Charging Box Do? 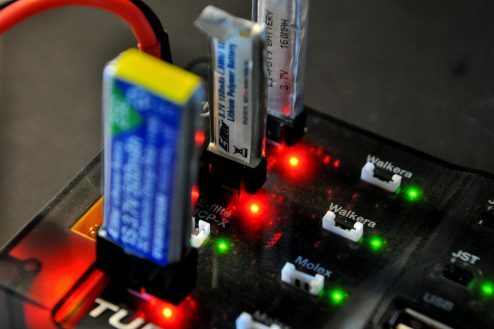 Simply put, if you have multiple 1S batteries and you would like to charge together, all you need to do is connect them to the Turnigy micro battery charging box. It draws its energy from a battery or two 3S 11.1V’s. This is convenient, simple and easy to use and therefore it ticks all the boxes that a charger should do in my opinion. With a 2200 mAh Lipo, you have enough battery power to fully charge a Nano QX2 or more than 10 Inductrix batteries. The number of LED’s on the charger is also impressive, (it gives the charger a small Christmas tree look.) During charging the LED’s are red and when it is finished charging the LED’s are green. Yes! It works perfectly. The batteries charge quickly (about half an hour) and you can charge multiple at once. 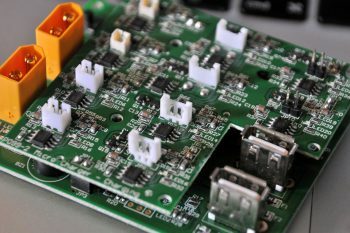 to modify the charging current by replacing a resistor printed on the circuit. This is a bit tricky because the resistance is of the CMS type. But the modifications is worth it if you wan’t to ensure the longevity of all your small batteries. Please tell us if you need a tutorial to make these changes. The Turnigy Micro Battery Charging Box is a handy accessory for charging at least two batteries of the same type. It is very useful if you often succumb to a small flight stress when your batteries run out of charge. Be careful though – the current may be too large for your batteries and thus reduces their life. It is available for just over 18 bucks from HobbyKing.